2 : 1 shunt in Atrial septal defect means what ? Is it same as qp/qs ? 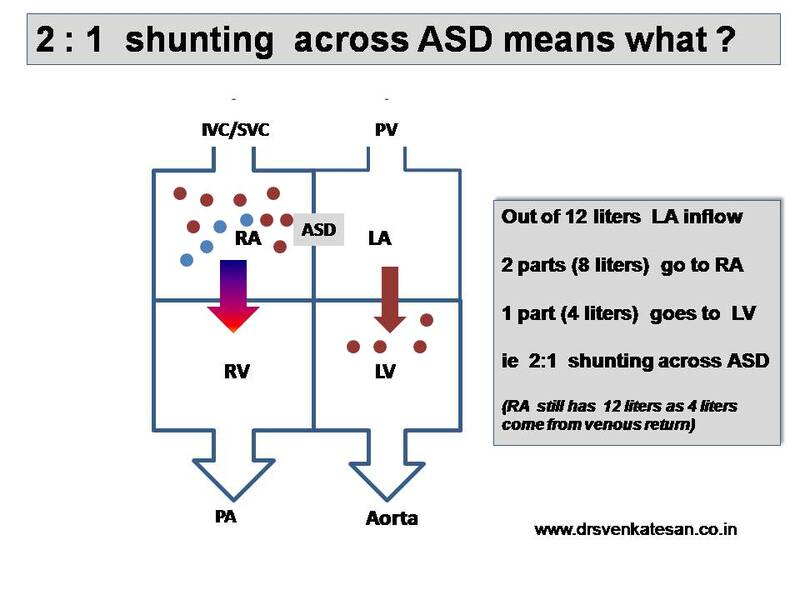 There was a big debate in one of my classes with cardiology fellows regarding the shunt quantification of ASD . 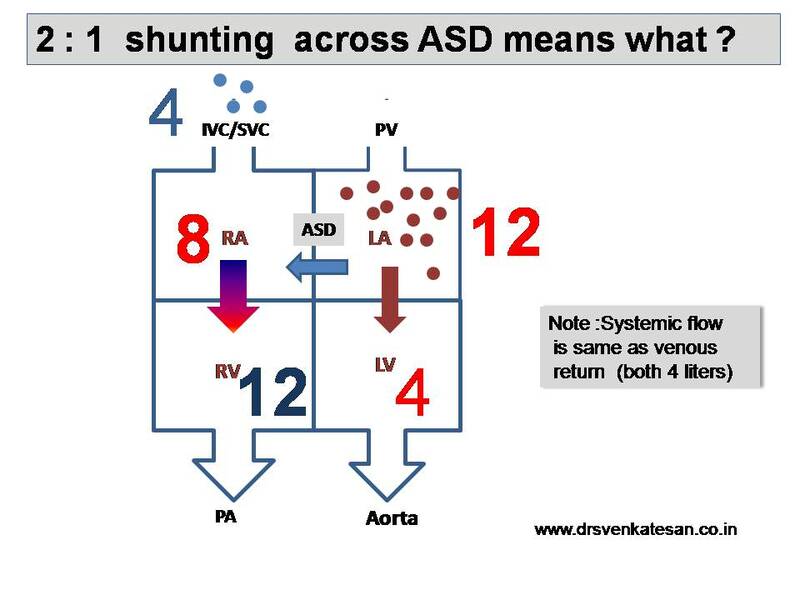 We were talking about the significance of ASD shunting . We suddenly realised 2:1 left to right shunt is not a simple equation to comprehend . I was thinking 2:1 shunt would mean pulmonary flow would be twice the systemic flow . It was not to be ! Is the ratio of shunting and Qp/Qs convey the same thing ? No . 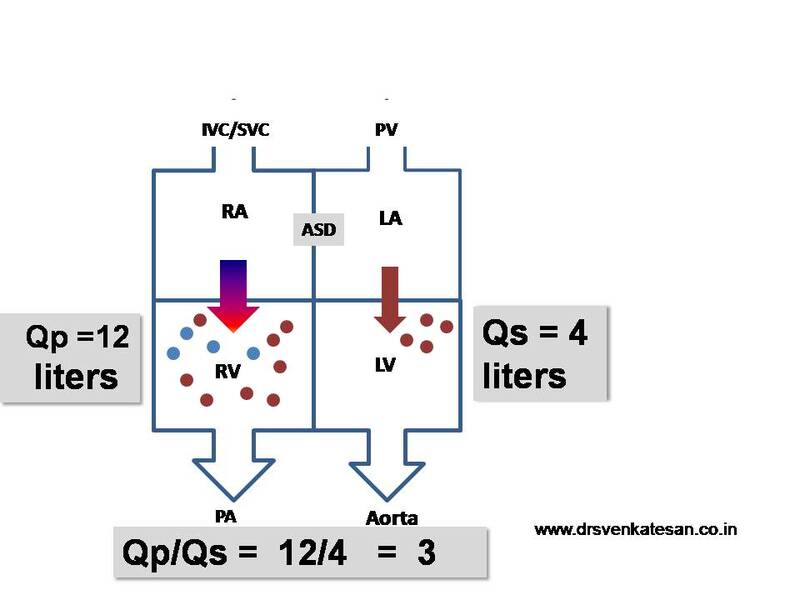 Qp /Qs is the ratio of pulmonary to systemic blood flow flow . When we want to quantify shunt we express it in two different ways . 1. The amount of blood shunted form left side to right side of the heart . 2. The amount of pulmonary blood flow to systemic blood flow in absolute terms . Though both are closely linked entities they do not denote the same meaning . When we say 2: 1 shunt we refer to the shunted blood across the defect but when we calculate pulmonary blood flow we take into account venous blood which does not take part in the shunting . Let us begin with a hypothetical ASD patient who has systemic cardiac output of 4 liters. He shunts 2 : 1 from left to right . ie he shunts 2 /3 of three parts into RA (66% ) . 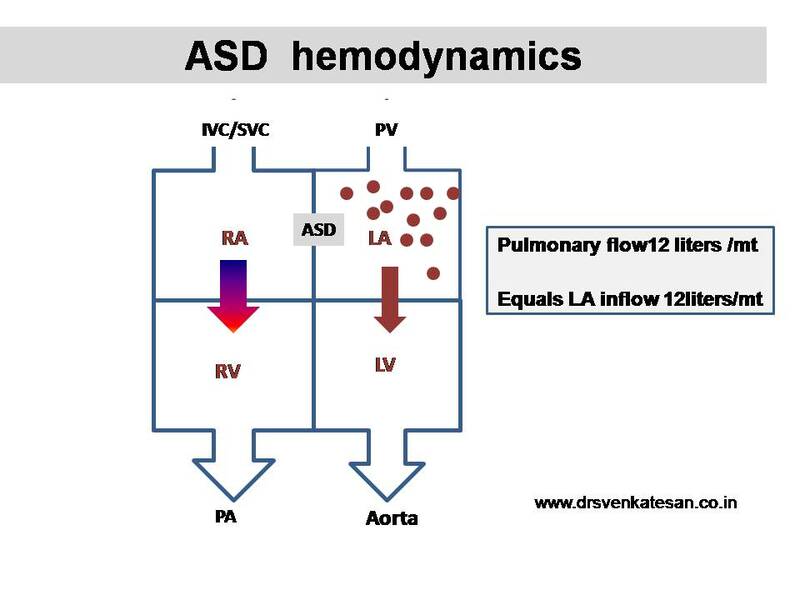 A patient who delivers 4 liters from LA in the presence of 2;1 ASD shunt would mean he would receive 12 liters from the lung as pulmonary blood flow. I am still not fully convinced about the above reasoning . I guess it is correct. I argue the fellows to give further insight into this equation. The complexities in bi- directional shunt and effective pulmonary blood flow in Eisenmenger syndrome is going beyond my heads ! a 40 year female presented to us with mild clinical cyanosis with gr I clubbing and clinical cardiomegaly and a harsh ejection systolic murmur in 2nd RICS and a loud pulmonic sound with fixed splitting. ECG showed a Right ward axis with evidence of right ventricular hypertrophy. 2D echo showed a large ostium secundum atrial septal defect measuring 28 mm with ? bidirectional shunt and a moderate severe Pulmonary valvular stenosis with peak gradient of 76mm Hg and mean of 56 mm Hg. what should guide management ? Im sorry , I dont agree with your explanation here. Please correct me if I am wrong. I think you have assumed 2:1 as three parts. 2:1 means 2 parts enter pulmonary circulation and out of this 2 parts 1 part enters systemic circulation. the other 1 part shunts across. However you have given a brilliant explanation for 3:1 shunt. I hope I have not increased the confusion!! 2:1 is 2 of 3 parts : 1 of 3 parts .. It is not a rare combination ASD + PS.. I guess it was referred to as Triology of Fallot Those days. Again it is extremely difficult to quantify effective pulmonary flow . There are two reason she needs intervention . Firstly at any time she is going to desaturate her systemic circulation badly. Two ,the Right heart may fail and worsen the situation even though it might reduce left to right shunt. . So go ahead and do the cath study. May be you can proceed with pulmonary valvotomy first and follow it with ASD closure. It would be real challenge to accomplish both with out surgery ! Of course sending the patient to the surgeon would be the best option in this situation ! i will add further information to aggravate the confusion. should we call this eisemenger’s physiology ? or an pseudo eisenmenger’s induced by pulmonary stenosis ? if we do pulmonary balloon valvulotomy alone, will we convert it into a pure L-R shunt ? despite PS, patient has a mild to moderate PR, with PADP of 36 mm Hg. My concern is if we dilate this PS and induce a free flowing PR will it worsen the hemodynamics ? will patient have a suicidal RV physiology ? is it a good idea to subject this patient to direct surgery with known eisemenger’s physiology ? about 2:1 shunt, my take is different. and the equation is maintained. does she need intervention or will she deteriorate with intervention ? Did you notice the major discrepancy between Echo and Cath . And cath reveals only 10mmhg . That makes the VPS non existent right ? Then the another surprise is the elevated diastolic and mean PA pressures . (I would guess any one who has a pulmonary diastolic > 60 would show Heath Edwards class 3-4 reaction in pulmonary arteries . i guess nothing to salvage from lungs. It is really surprising this women has developed Eisenmneger reaction inspite of RVOT obstruction . But now I doubt the significance of the Echo finding . So now in my opinion leave the patient alone . The puzzle does not end there. What data I mentioned was room air findings. On giving 15 lts O2 thru mask, the whole picture is changed. What do u think has happened? Do we have a predominant l-r shunt with Mild ps with significant pulmonary vascular reactivity ? Still the PA pressure is significantly high and bound to get altered once we try to open the PS .